Overlooking the South China Sea at Sanya’s Haitang Bay and located only 40 minutes’ drive from Sanya Phoenix International Airport, the five-star contemporary and oriental-styled Renaissance Sanya Resort & Spa features 507 guestrooms including 90 suites, 10 two-bedroom villas with private swimming pools, a 1,000-square-metre Presidential Suite, a private white-sand beach, seven restaurants and bars, 2,500sqm of event facilities, a deluxe Quan Spa, fitness centre, Sanya’s largest lagoon pool, a cinema, 10-pin bowling alley, table tennis, tennis courts, badminton court, billiards centre, Wii, Xbox and PlayStation zones, and R Kids, the resort’s kid’s club with in-door and out-door play areas. Upon arrival at the entrance of the resort, guests are greeted by surrounding therapeutic water features and the picturesque panoramic view of the South China Sea from the lobby, which is an absolute refreshing and breathtaking delight! The impeccable welcome extended by the front office and concierge teams makes it a great start to a ‘home’ retreat away from home. Surrounded by extensive lush tropical gardens, the resort’s 10,000-square-metre lagoon pool is currently the biggest pool in South East Asia, made up of a lap pool, a spa pool, a children’s pool with waterslides and a R Kids Splash Park with spraying rainbow gate, water bell, water spraying crabs and frogs. The recreation team organises complimentary daily activities including beach volleyball / football, morning jogs, gym introduction, and yoga lessons. Water sports are also available with activities such as scuba diving, sailing, and water skiing. A variety of food & beverage options are available at the resort’s restaurants and bars. The unique-style Star Fish Market Seafood Restaurant is located in the resort garden near the beach, and features a Southern Asian style setting. Guests can choose from the finest quality ‘catch of the day’ from live tanks and a menu of seafood and fresh local vegetables, cooked to individual tastes and requests. The Star Anise is a Chinese Restaurant with 14 private dining rooms, and serves authentic local cuisine. Candy Box, the resort’s Deli Bar is a 1950s themed espresso bar serving great coffee, deli delights, ice cream and desserts. The Star Fish Bar, a beach & pool bar with alfresco seating serves tropical cocktails, burgers, snacks and live music, overlooking the pool and the private beach. Located at the main building of the resort, R Place is a British-style sports pub with private karaoke rooms, and the Lobby Bar Lounge serves an array of coffee and Chinese tea selection, fine wine, cocktails and elegant bites, accompanied by stunning views of the South China Sea. Marriott’s spa brand, Quan Spa is located in the resort’s garden, spanning 2,274 square metres. Housed in a Chinese palace-style facility and surrounded by classic European landscaping, the spa has seven independent villas, with separate areas for resting, foot massage, chi pavilion, changing rooms with sauna, steam and Jacuzzi. Whilst Sanya is a perfect destination for a short or long-term retreat, it is also an ideal location to host MICE events (Meetings, Incentives, Conferences, Exhibitions). Renaissance Sanya Resort & Spa offers the largest ballroom in Sanya – Universe Ballroom, which spans 1,430 square metres with a ceiling height of seven metres, and accommodates over 1,200 guests. The adjacent gardens and pre-function areas are perfectly suited for pre-dinner cocktails. There are five additional meeting rooms, ranging from 70 square metres to 150 square metres, an outdoor lawn party area and a private beach, suitable for various types of unique events. A luxurious motor yacht can also be organised for clients wishing to take to the sea for the day. For golf enthusiasts, located close to the Renaissance Sanya Resort & Spa are Clear Water Bay Golf Club (15 km); Sun Valley Sanya Golf Club (18 km) and Yalong Bay Golf Club (18 km). Local attractions include the Nantian Hotspring, popular for its individual and communal thermal mineral pools and the Wuzhizhou Island, an excellent choice for scuba diving and snorkeling around the coral reef, just 2.7 km offshore. With its fully integrated facilities and impeccable service, it is no wonder that the Renaissance Sanya Resort & Spa has won numerous prestigious awards over the years including the ‘2012 Top 10 Most Popular Resort Hotels’ at The 9th Golden Pillow Awards of China Hotel, ‘Top 10 Resort in Hainan Island’ at the 2012 Golden Coconut Awards by Safari Magazine, ‘2011 Best Hotel Presidential Suite’ by Travel & Leisure Magazine, ‘Best New Hotel’ at the 2011 Hotel & Resort Best Value Awards by Voyage Magazine, and ‘2011 Choice New Hotel’ at the Golfer’s Choice Award by Golf Vacations Magazine. 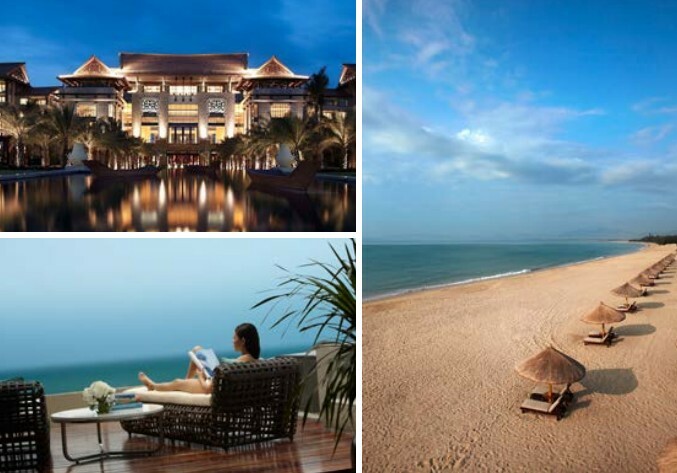 The Renaissance Sanya Resort & Spa is currently offering a special Renaissance Children’s Package at RMB 1,288 per night for a Deluxe Room with a complimentary upgrade to a Deluxe Sea View Room from now until 31st October 2013 (Not applicable during the national holiday). The ‘Renaissance Children’s Club’ and R Cade Games Centre have tailor made an extraordinary vacation experience for children between the ages of four and 16 with activities such as fairy tales storytelling, learn to make handmade crafts, painting, dancing, blocks building, cooking and exploring local customs etc. For the teenagers, the R Cade Games’ Centre offers PS3 video games, Xbox, Wll, other electronic games as well as bowling and a movie theatre which can be enjoyed by the whole family. For more information or for reservations, please contact Ada Wang (Marketing Communications Manager) at ada.n.wang@renaissancehotels.com .